Plantar Faciitis pain and relief from foot pain is an important topic for any pain relief reference. Plantar fasciitis: “Inflammation of the plantar fascia (fasciitis), the “bowstring-like” tissue in the sole of the foot stretching from the heel to the front of the foot.” – The Medterms Dictionary. Plantar Fasciitis and Heel Spur Syndrome: What are they? Pain in any form reduces the joy of everyday living. Your focus is not on the things you want (and need) to do but is instead on where you’re hurting. One common complaint is pain from Plantar Fasciitis and Heel Spur Syndrome. It’s important to understand what Plantar Fasciitis and Heel Spur Syndrome are and how they are connected. Just to be clear as to what the plantar fascia is, it is a thick, broad, inelastic band of fibrous tissue that runs along the bottom (plantar surface) of the foot. It is attached to the heel bone (calcaneus) and fans out to attach to the bottom of the metatarsal bones in the area of the ball of the foot. Because the normal foot has an arch, this tight band of tissue is at the base of the arch. In this position, the plantar fascia acts like a bowstring to maintain the arch of the foot. We now know what the two pain-causing issues are and that they are connected. The heel spur itself is not what causes the pain. When the inelastic band of fibrous tissue that makes up the plantar fascia becomes stretched out, tiny tears can occur in its surface. This causes inflammation and pain. Heel spurs are now thought to be the result of the pain from Plantar Fasciitis. The classic sign of Plantar Fasciitis is heel pain with the first few steps in the morning or after periods of prolonged sitting. The pain is usually in the front and bottom of the heel, but can be anywhere along the length of the plantar fascia. Pain often will diminish as the muscle warms up. Plantar fasciitis starts out as a sharp pain that turns into a duller, intermittent pain as the day progresses. The pain usually increases after standing or walking for long periods of time, and at the beginning of a sporting activity. Similar sensations to Plantar Fasciitis pain may occur with bone trauma or other injury to the soles of your feet. You may also experience sharp heel pain if the cushion layer of tissue over your heel is too thin. Either way, the debilitating pain to the area can sharply reduce the quality of life. Excessive pronation, flat feet or high arch. It’s important to note that Plantar Fasciitis can become a chronic condition if left unchecked. In very few cases, surgery may be required. How can Plantar Fasciitis and Heel Spur Syndrome sufferers ease their pain? Stretching the calf muscle several times a day, especially in the morning and after prolonged sitting. Arch supports, or orthotic devices especially for flat feet and high arches. Lose weight if possible; this helps relieve the excess tension in the planter fascia. Are there any other methods of finding relief for my suffering? There are other methods that therapists use to provide pain relief for Plantar Fasciitis. Using TENS (Transcutaneous Electrical Nerve Stimulation) effectively blocks pain signals to the brain. Then using low-frequency EMS (Electrical Muscle Stimulation) helps to condition the muscles in your feet and legs and helps increase and improve the blood circulation in the localized area. This helps bring blood full of nutrition and oxygen to the tissues in your feet and legs while pulling toxins away. The EMS will have a more subdued but longer effective result for pain relief while helping the tissues heal. Rhythm Touch electrical muscle stimulator and the Advanced Foot Energizer have proven effective in relieving pain. Save 10% on Advanced Foot Energizer or Rhythm Touch Complete Kit and Packages. Join newsletter for code. Use of low-frequency electrical stimulation for the treatment of plantar fasciitis. Stratton M1, McPoil TG, Cornwall MW, Patrick K.
J Am Podiatr Med Assoc. 2009 Nov-Dec;99(6):481-8. Do you have experience using electrical stimulation for PF? 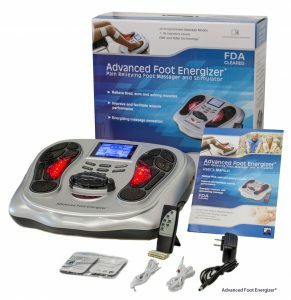 I personally used the Advanced Foot Energizer to help me recover from Plantar Fasciitis. What I found was that using the TENS modes helped with quick pain relief while using the EMS modes helped with long term recovery. I personally like mode 24 (Shiatsu), mode 7 (pulling massage) and mode 8 (pushing massage). Honestly I use mode 7 the most but like to change now and then so that I don’t experience muscle memory. I generally use mine at an intensity of about 65. Everyone is different about intensity. I have a friend who never goes above 20. For me it took some time to recover but I was already speaking with a surgeon who recommended electrical stimulation as an option to try first. I also added some inexpensive insoles to my shoes to help with cushioning my feet: the “FREEDOM High Impact Accommodator” which you can find on Amazon. Now I’m able to trail run again 3 or 4 times per week and use the Advanced Foot Energizer in the evening after running. It’s so great not experiencing the broken glass feeling when getting out of bed in the morning. The studies done in testing the TENS units in my opinion and experience with a calf muscle tear, do not use the TENS unit enough for a sufficient effect. A one time per day treatment is akin to doing one set of reps while working with weights in other muscle groups. Improvement? Maybe. Good muscle growth and strengthening? Not likely. In identical torn calf muscle incidents where the first was treated with standard PT and rehab, was 6 weeks. The next year the opposite calf tore. Using Arnica Montana and a handheld TENS unit all day and all waking night yielded 3 weeks heal time. The TENS unit cables were run up the leg over the waistband and into the pocket. No one could tell a treatment was going on. Back on the karate floor in 3 weeks over 6 weeks. I’ll take that any day.